Woo Hoo I'm first for a change. These Friday's come around fast, thanks Wendy. 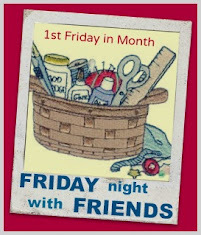 I will have stitching to do Friday night - and join you all through the lines of the internet! Thank you. I have some things to show, an I am going to be making some fibre art post cards. They will keep me busy. The time has gone very fast. Woo! Hoo! Looking forward to spending time with needle & thread and my cyber quilty friends! ready & raring to go! Was great to join this. With a large to do list I sure was motivated. Thanks for hosting.